This weeks book sounds exciting, with a interesting cover. I'm curious to get my hands on a copy. Emmett Atwater agrees to leave Earth behind when Babel Communications offers him a fortune. The catch? He has to launch into deep space to get it. One of ten selected recruits, Emmett boards the company's spaceship and sets course for a planet that Babel has kept hidden from the rest of the world. Every training session is a ruthless competition where friendships are tested and enemies are made. 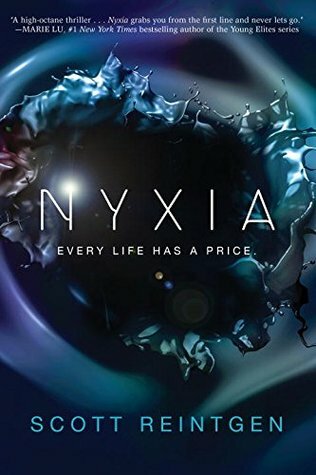 Each recruit must earn the right to travel down to the planet of Eden-- where they will mine nyxia, a substance that has quietly become the most valuable material in the universe. Ooh nice! That's a new to me one! Hope you enjoy it! I can't believe I haven't heard of this one before, it sounds amazing. Great minds think alike! This was also my choice for WoW this week. :) Here's hoping that we both love it! Oooo, what a great cover! Is this an indie/self-published book? I'd not seen it before. I hope you enjoy this book when you get the chance to read it!